Thinkspace is pleased to present new works by Korean-born painter Amy Sol in Bird of Flux. 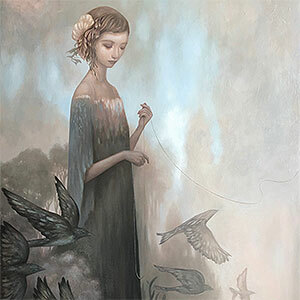 A self-taught artist currently based in Nevada, her delicately rendered paintings offer introspective meditations on the fluidity of fairytale and fiction, tapping into the endless permutations of subconscious reverie. Sol’s intuitive imagery is drawn from instinctual reserves, referencing several visual traditions of storytelling by enigmatically combining both the personal and archetypal. In her new body of work, Sol explores themes of transition, adventure, and adaptation, considering the individual faced by external and internal forces of change. In Bird of Flux physical metamorphosis is posited as a visual metaphor for inner transformation, offering the viewer borrowed ingress into an imaginative universe of muted hues, unlikely companions, softened edges, and shadowy phantasms. Sol’s graphic and illustrative inspirations are drawn from enduring collective influences. Everything from animation to decorative design makes an appearance in her esoterically stylized worlds. Influenced by Japanese manga and the whimsy of Ghibli films, as well as the idyllic natural worlds of classic-era Disney and the Golden Age of turn-of-the-century American Illustration, Sol Incorporates references to varied cultural and folkloric embodiments of the feminine. Her works often feature a female protagonist in collusion with supporting animal or creature characters, a tradition of friendship long spun in popular culture from animé to Bambi. Presented in a state of calm albeit apprehended action, the narratives she advances remain partial and unresolved moments, mere glimpses in a shifting arc rather than a finite plot. These imagined propositions are lawless rather than earth-bound imperatives. With a creative unhinging, Sol’s limitless imagination slips fluidly beyond the restrictions of the real into a world of surreal gentility. Technically self-taught, Sol has spent many years perfecting her own mixed pigments and materials. Known for a distinctive palette with a subtle ghostly cast, she has in recent years experimented with more intense contrasts and darker hues. Her use of color often recalls late 19th and early 20th-century illustration, art nouveau design, and even the Celadon vases she remembers from her childhood. The diffuse effect of her pigments, however, tends to feel generally nostalgic rather than specifically referential, as though drawn from a distant and strangely non-existent past. Her technique is labor intensive, involving the application of several layers of acrylic washes to achieve the translucence and opacity of her surfaces. She is also using oils and exploring sculpture in this new body of work. Preferring wood panel to canvas for its unique material qualities, Sol often allows the organic nature of the substrate to dictate the direction of her compositions. Bird of Flux will include new paintings and sculptural works by the artist. In the spirit of transformation on both conspicuous and imperceptible planes, her new output fittingly reflects her own openness to experimentation and unexpected shifts. Sol’s poetically measured images retain traces of melancholic pause in spite of their idyllic beauty and calm, feeling at times like the magic of fairytale tempered by the ambivalence of the adult. Personal and simultaneously universal, the powerful quiet of her works forces a reflective distance into an otherwise unmanageably chaotic visual world.